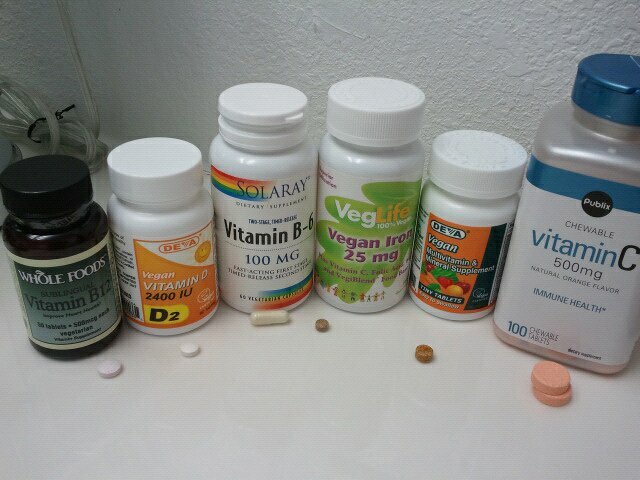 One of the main reasons I wanted to share was because I’m so happy with all of the supplements I’m taking currently, and part of that is that they’re all vegan, sure, but the main reason is they’re all small, easy to swallow pills. I’m one of those people that hates swallowing pills, and cannot do the horse pills at all. If you are too, this might help with finding good brands. Every morning I do the non-swallowing ones. Chewable Vitamin C and sublingual B12. You have to take B12 sublingually or it won’t absorb. The vitamin C tablets tend to be large, so I get chewables to make life easy. Mine are from the grocery store. I had to carefully read several brands before finding one that was vegan. A lot have milk, so check ingredients! I get the Whole Foods brand B12 or whatever is “suitable for vegetarians” and around. I take the rest before bed. Not sure why, I just do. Deva D2 2400 IU. This is the vegan version of vitamin D. Most of the ones you find in the store are D3 and made with a little help from your sheep friends. These pills are also nice and tiny! I started taking vitamin D at the insistence of my mother. It’s the “sunshine vitamin”, since your skin produces it when you go in the sun. I, however, am a heliophobe [somewhat goth] chick, so I definitely am not getting any the natural way, and mom was concerned about my bone health. Oh, and she has it on authority from Dr. Oz too! Solaray B6 100mg. I take B6 on recommendation from the Gyn for helping PMS, though she recommended 50mg. I think 100mg works better for me. Although they’re not tiny, they’re very easy to swallow thanks to their cellulose vegan capsule. Yay! Veglife vegan Iron 25mg. This is the normal amount in multivitamins. I bought the tiny tablet multis that don’t contain iron, so I have to take it separate. I’ve always been borderline anemic (since I was a kid!) and now I don’t bruise all the time! Sweet. Deva vegan multivitamin Tiny Tablets. These are indeed tiny and easy to swallow! The trade off is that you have to take your iron separate. No problem.